June 22, 2011, 8:30 a.m.
By Andrew Phelps June 22, 2011, 8:30 a.m. The Knight Foundation today will announce a major commitment to MIT’s Center for Future Civic Media: a three-year, $3.76 million investment, a new boss, and a newly refined mission. Oh, and it’s just the Center for Civic Media now — new name, too. Ethan Zuckerman, the Global Voices co-founder and longtime Berkman Center fellow, will be named the center’s new director and principal research scientist. The Center — which debuted a new website a few hours ago too — sprang from a proposal that won $5 million from the first Knight News Challenge, in 2006. (Knight will announce the winners of the fifth and final News Challenge today.) It’s a collaboration of the MIT Media Lab and the university’s Comparative Media Studies program. “What appealed to Knight Foundation was the notion of taking the internally focused aspects of the Media Lab experience — so, the tradition of engineers innovating for innovation’s sake — and trying to turn that internal focus outside to create greater ties to communities, so that community needs and desires were driving some of the innovation at the Media Lab,” said John Bracken, Knight’s director of digital media. Many projects remain unfinished; others should surely be abandoned, as is common in incubators and as is the practice at C4; and new efforts will be folded in or developed in the years to come. And it would be hard for many other kinds of institutions to seek to mimic C4’s exact approach. But some broad and universal lessons emerge from C4’s early years that are worth sharing in public, talking about, and building upon in ways that are both direct and indirect. “I think there will be some refinement,” Bracken said. “More than anything we’re just excited about the combination of Ethan Zuckerman directing the Center under the leadership of Joi Ito, who’s directing the Media Lab,” Bracken said. Ito is a technologist and investor, not an academic. His appointment was announced in April. Zuckerman will replace Chris Csikszentmihályi, who is leaving the institution after serving as director for three years. Ethan Zuckerman: The Media Lab has a lot of “Center of Future” things and I think the naming convention, when the Center started almost four years ago, was to follow along that convention from the Media Lab. The truth is this field is moving so quickly that in many cases I’m actually interested in the present of civic media…I’m not sure we needed “future” in the title. Andrew Phelps: What exactly is the Center for Civic Media? What do you hope it will become? The Center is going to be a place that’s investigating this question of how communities get information, how communities produce information, how people make decisions about becoming civically active. It’s a broader approach to this than just citizen journalism, which is really the space that I’ve worked in for the last several years. Civic media can be all about mobilization. It can be all about community documentation. It’s sort of journalism and more. It’s a very, very broad remit. It’s basically as broad as this question of how do communities make decisions based on information? Within that incredibly broad swath, there are a couple of areas that I’m excited about focusing on. A lot of my work the last couple of years has been on trying to help us listen to voiceless, marginalized people. So you can read the Global Voices project in that way. It’s an attempt not just to give people in the developing world a chance to speak, but also give them a better chance of being heard. And that’s an issue that’s really front and center to some of the past work at Center for Future Civic Media. In particular, I point to something like Charlie DeTar’s work on Between the Bars, which is trying to let incarcerated people blog by the postal system. Or the work that’s being done on Heroreports, which is the system being used in Mexico to let people report on community acts of heroism, as sort of a response to “See Something, Say Something” to report concerns about the community, to report the positive as well. One of the themes, I think, is not just letting people who are marginalized speak, but trying to help them be heard. A second theme might be trying to figure how to enable positive participation. So one of the interesting things that’s happening in the civic-media world is that it’s very, very easy for activists all over the world to start a movement. You’ve got women in Saudi Arabia making YouTube videos of themselves driving as an act of civil disobedience. You have lots of people express support and solidarity with this. You saw Nancy Pelosi tweeting in support of all of this. Is there something we can do beyond solidarity? How do you build civic-media systems that let people participate productively in support of other people’s struggles? So I’d really love to get beyond the Iranian revolution and turning your Twitter picture green. I’d really love to find a way and a structure that makes it easier to do productive participation. The third thing that the center has already done brilliant work on is that a lot of what’s most interesting in civic media is the way that it’s rooted in real geographic communities. And I think one of the things that the center has done fantastic work on is thinking about the power of maps. And maps not just as sort of a visual representation, but maps as a conceptual way of putting a layer of information on top of the physical world. So how do you let communities build maps of what’s important to them, what’s of concern to them, favorite places, places that they’re worried about — how do you build maps collaboratively and in a way that the whole community can participate in it? And some of the work that’s been done, like Jeff Warren’s work with Grassroots Mapping, literally letting people build low-cost aerial photography rigs and community maps, I think is very, very consonant with that. And then the fourth thing that I know that I’m really focused on is this question of understanding the ecosystem. There’s been rhetoric around the idea of media ecosystems for three or four decades now. But that rhetoric is actually much more helpful in the context of the civic-media world, where things just got a whole lot more complicated. We’re not talking about an ecosystem of newspapers and a couple of broadcasters. We’re now talking about an ecosystem involving bloggers and twitterers and Facebook and YouTube, as well as all this broadcast media. And literally just trying to figure out how this all works together — what makes one story go viral and another one disappear? Who is shaping the news agenda? These aren’t just academic topics. These are actually hugely useful if you are an activist and you’re trying to figure out how to get an issue or a cause to be taken seriously. So I want us to be doing some working and thinking in that space, not just because I think they’re fascinating academic questions, but I think it’s the sort of intelligence you need to be an effective civic actor. You need to figure out how you raise your voice effectively and how you get heard in this age. The great news on all of this is that there’s terrific work being done already at the center on all these projects. And then the hope is that we’re going to be able to bring in lots of people, first as master’s students, some as fellows, because we’re hoping to do more with a fellowship or a visiting scholars program, and a lot through partnership. Boston is just an incredibly rich town as far as people doing innovative work in this space. And so the goal is really to open up the doors and get as involved as we can with a very broad range of folks around these and some other questions. EZ: I think what’s amazing about the Media Lab is there’s a real need to deliver a tool. If you are a master’s student or a Ph.D. student at the Media Lab, you’re ultimately judged on what you end up building. I think what’s great about that it forces you to blend the theory and practice. It’s, I’m sure, possible to ignore theory altogether and build what appears to be practical, but I doubt that that’s where we’re going to be going. There’s so much smart thinking happening about civic media right now — it’s such a rich topic — and the sorts of people who are involved at the center are so interested in the debates that are going on in this conversation that I think we’re not going to have any problem being very active participants in the dialog about theory. I think the fact that this is really a partnership between the Media Lab and Comparative Media Studies over at MIT guarantees that we’re gonna be engaged in those dialogues and, I hope, helping lead those dialogues. But at the end of the day, particularly the Media Lab students need to produce something useable. And I think that’s a great challenge to throw into all of this, to make sure that this doesn’t ever become purely theoretical but, it’s always straddling the boundary between theory and practice. AP: Speaking of the Media Lab, you get to work with Joi Ito, another big get for MIT. EZ: We’re very close friends. We sit together on the board of Global Voices. I invited him on that board years back. We’ve been involved with a variety of different projects, and he’s one of my favorite co-conspirators. I thought it was just a brilliant choice for MIT, and it actually helped compound my excitement. I had been in discussions about this position for awhile, because it involved writing the new grant for the Knight Foundation, so we’ve been talking for many, many months now, and a lot of the conversations with Joi were in parallel, and I was just thrilled to find that out. Not just because Joi is an extraordinary individual to work with. He’s got some of the best sense for what’s really happening. He’s an incredibly knowledgeable figure within the citizen and civic-media space and really the broader participatory tech space. He’s got such a practical point of view on it. He’s really interested in what works and what people use. And then beyond that, it just seemed to me that his hire was evidence that MIT understood in a very real way that in a subject like new media, you really need a wide variety of people at the table. You need people who have rigorous academic experience, but you also need people who understand the tech and understand the business of the tech and the community of the tech. And so the willingness to involve someone like Joi, who doesn’t have a formal academic background but has unparalleled experience in bringing tech to market and working with passionate users, just seemed to me like such a smart move. Couldn’t be more excited about that. 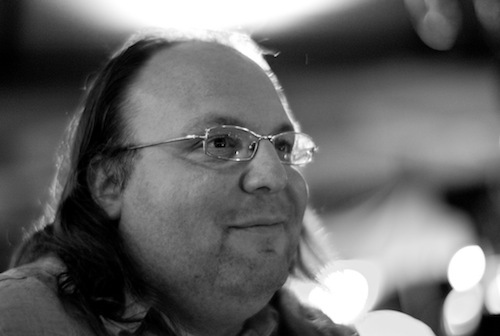 Photo of Ethan Zuckerman by Joi Ito — his new MIT colleague — used under a Creative Commons license. POSTED June 22, 2011, 8:30 a.m.
Phelps, Andrew. "New commitment, new boss, new name: Knight to invest nearly $4m in MIT’s Center for Civic Media." Nieman Journalism Lab. Nieman Foundation for Journalism at Harvard, 22 Jun. 2011. Web. 24 Apr. 2019. Phelps, Andrew. "New commitment, new boss, new name: Knight to invest nearly $4m in MIT’s Center for Civic Media." Nieman Journalism Lab. Last modified June 22, 2011. Accessed April 24, 2019. https://www.niemanlab.org/2011/06/new-commitment-new-boss-new-name-knight-to-invest-nearly-4m-in-mits-center-for-civic-media/.